Brief profile below. We have a viewing day on the 23rd February. If interested contact me via email only using sportsandsporting@gmail.com and I’ll send over full details. The Stobgreen Shooting Syndicate extends over two areas of land, one of about 400 acres at Stobgreen on the fringes of Eggleston Moor and the other of about 700 acres at Deepdale, Lartington. Both areas of land are within 5 miles of Barnard Castle in the Upper Tees Valley which is close the A66 and gives access to the A1 in 20 minutes and M6 in 40 minutes. Stobgreen Plantation is situated on the South facing slope on the edge of Eggleston Moor and overlooking the Upper Tees Valley with views extended to Wemmergill, Holwick, Cotherstone and Bowes Moors. Stobgreen was a small Grouse Moor until the 50’s when it was put into commercial forestry. 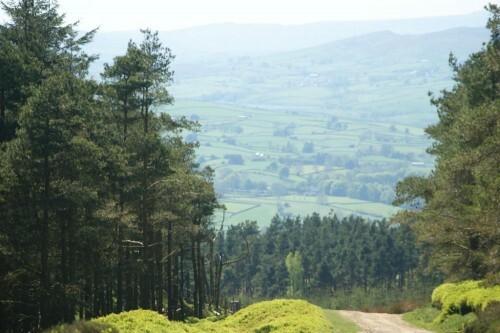 Over the last 20 years the plantation has been extensively felled and sympathetically replanted or left to regenerate so that we now have a patchwork of mixed age timber, new plantings, open cover and moorland. Drives are varied over clearings, streams, valleys and roads with most dropping downhill giving testing shooting. Although a former commercial forest which is often associated with a lack of ground cover much of the original planting at Stobgreen was thin or unsuccessful so we do have heavy and varied ground cover which makes it perfect for Pheasant and Woodcock. We now have an area of about 100 acres of pioneer heather on the edge of Eggleston Moor and we do hold good numbers of Grouse. Stobgreen also has 10 duck flight ponds. Closed season access is permitted at Stobgreen for the purposes of rabbit and pigeon shooting. Members book in to shoot during the closed season via our online forum. Deepdale is a traditional shoot which was planted up and managed as a Sporting estate. We have 2 lakes at Deepdale which provide good duck shooting, we have the fishing rights over one lake. Deepdale has a magnificent lunch hut that is the hub for many social days and we use this on as many shoot days as possible. Deepdale has varied terrain with drives from Game Crops, small woods, the High Lake Snipe Bogs and, as the name suggests, the very deep Deepdale!! Up until now we have sub-let our deer stalking at Stobgreen to a syndicate however we will be keeping this within our Game Shooting syndicate in 2019 so all competent syndicate members with a suitable rifle will be able to partake in stalking at Stobgreen. There is no stalking at Deepdale. Until this 2017 Stobgreen and Deepdale were run as separate syndicates with their own membership however we have decided to wind up the Deepdale syndicate and we have taken it into the Stobgreem syndicate and we will run with one combined membership 2019 release will be 3200 Pheasants. We anticipate 2500 to Stobgreen and 700 to Deepdale. In our shoot budget we have factored in a £2000 reserve fund and we have introduced this in case of a high grain price (in excess of £200 per ton) or unforeseen emergencies. It will be clear by September 2019 if we will need to tap into this reserve fund, if we do not need to use it for day to day running or emergencies then we will use this money to purchase Redleg Partridges for release at Stobgreen Commencing 2019 we will be employing a part-time Gamekeeper. We shoot on 17 Pheasant days with all members selecting and shooting on 10 days from the 17 available. We have a meeting in June 2018 when members agree which 10 days they will take. We also have 8 Grouse Days and all members select 3 Grouse Days. Shoot days are on a Saturday with the exception of 3 days. We have Working Guns and Non-Working Guns. Full Work Days for Working Guns will be the second weekend (you can select Saturday or Sunday) of every month March to October (8 days) inclusive and also Feeder Filling days on the second Sunday of November, December and January (3 days). Every working members must attend a minimum of 6 Full Work Days and 2 Feeder Filling Days. Subs will be £900 for a Working Gun and £1200 for a non-working gun. A minimum of 50% to be paid by the 1st April and the balance by the 1st June. We will have a half-gun and this is £700. There is a one off joining fee of £200 for new members and this is payable in full immediately accepted into the syndicate in order to secure a place. Closed season access for Pigeon Shooting, Rabbit Shooting, etc is permitted from the 2nd February onwards. There is some excellent Pigeon flighting to be had at Stobgreen and bags of 50+ are not uncommon. Fishing is available at the Deepdale Low Lake. To use the sites book in online via the forum. Members do need to be fit, sociable and safe BUT we do welcome Novice shooters and will help to introduce and mentor them. Grouse Days will be 7 beating and 7 standing. All full members will get a minimum of 3 Grouse Days. Half Guns will get 1 Grouse Day. Visitors are advised that BASC cannot accept responsibility for statements made in advertisments on this, or linked external sites.